Amsterdam is nothing short of picturesque and charming, with canals and museums galore. Home to both the Anne Frank and Van Gogh Museums, the Venice of the North is connected to its neighboring cities by a vast network of buses, trains and bike routes. One of the best things about the Netherlands is that it is a small country with so much to offer, and this makes its capital Amsterdam the perfect place to plan a day trip to other Dutch destinations and beyond. The Zaanse Schans is located just north of Amsterdam and offers visitors a window into the history of the Netherlands. It boasts a wide collection of windmills, old wooden houses and specialty shops. I love Zaanse Schans because, while obviously touristy, it’s a journey to the past where you can see how Dutch made their produce, the first Albert Heijn store, and naturally many windmills you can get into. There are several operating windmills that produce oil and spices and a cheese farm where you can learn the difference between gouda, goat and herb cheese. Chocolate lovers will find their cocoa heaven at Zaans Gedaan where they can make their own chocolate from scratch using real cocoa beans. There is something for everyone there. Other attractions worth mentioning are the Bakery Museum and Jisper House where visitors can dress up in the region’s traditional clothing and pose for pictures inside the fisherman’s cottage. Different guided tours and packages are on offer at the museum and one of them is a seasonal package deal where you get to explore the museum on foot before going on a boat trip along the Zaan River. Purchasing the Zaans Schans Card for €15 allows you to visit many museums free of charge and entitles you to discounts in souvenir shops and restaurants as well. Zaanse Schans is accessible by train, bus or private tour. There is a bus available to take visitors to Zaanse Schans every 15 minutes from Amsterdam Central Station and takes around 40 minutes. Taking the train allows you to reach the museum faster. You can catch a train headed for Alkmaar and get off at the Zaandam Station, then walk for 15 minutes. 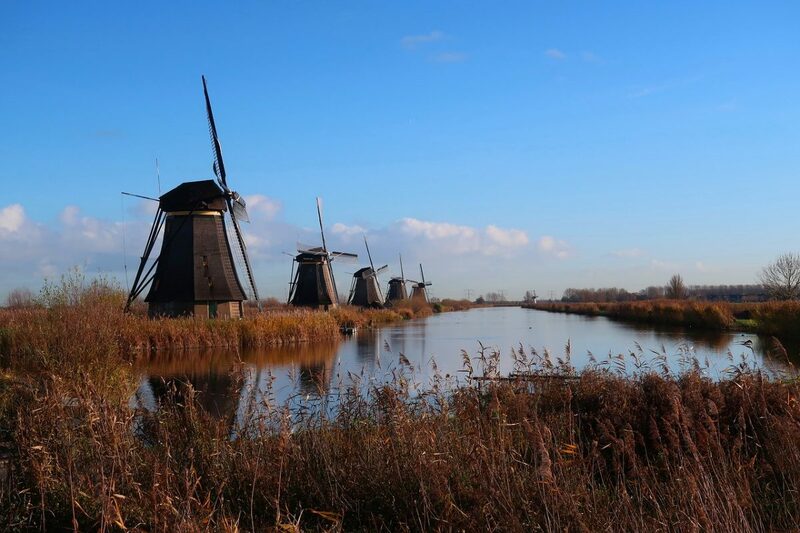 This little town in the South Holland province is best known for its iconic Dutch windmills which have actually been named a UNESCO World Heritage site. 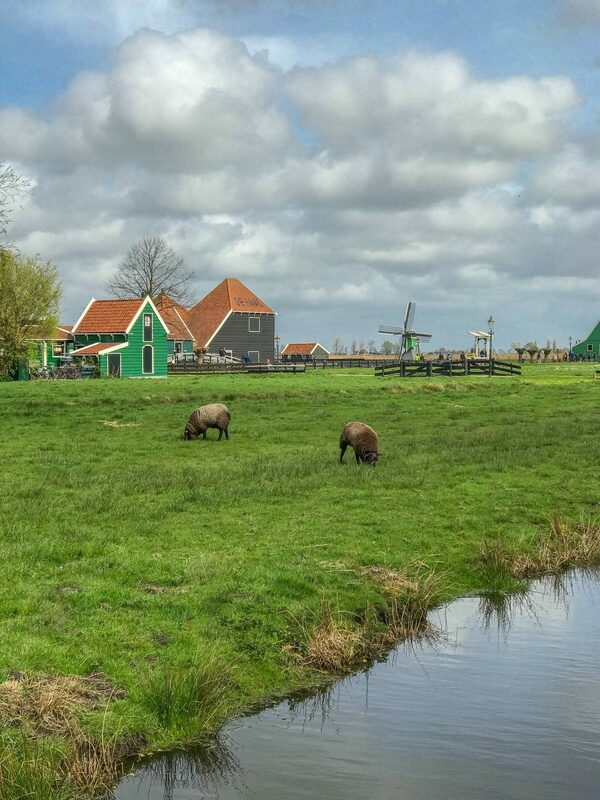 The group of 19 windmills at Kinderdijk have been preserved since the 17th century and some house fascinating museum exhibits about the history of the windmills and water management in the area. You do have to pay admissions fees to visit or tour the windmills and museums but a view of just the landscape is still something to behold. The area historically suffered from severe flooding and it was given its name after the famous Saint Elizabeth Flood in 1421 Literally translated, Kinderdijk means ‘children’s dyke’, which inspired a fairy tale ‘The Cat and The Cradle’ where after the storm, a wooden cradle was spotted on the flood waters, in which a cat jumped to and fro to keep the cradle afloat. Kinderdijk is accessible by train, bus or boat from Amsterdam through Rotterdam. The NS from Amsterdam Centraal Station can take you to Rotterdam Central Station. From there you would then take the metro to Rotterdam Zuidplein, and then bus the to Kinderdijk. Alternatively, take tram 8 or 25 or the metro line “Erasmuslijn” from Rotterdam Central Station to the Leuvehaven stop and boats depart from the Boompjeskade. 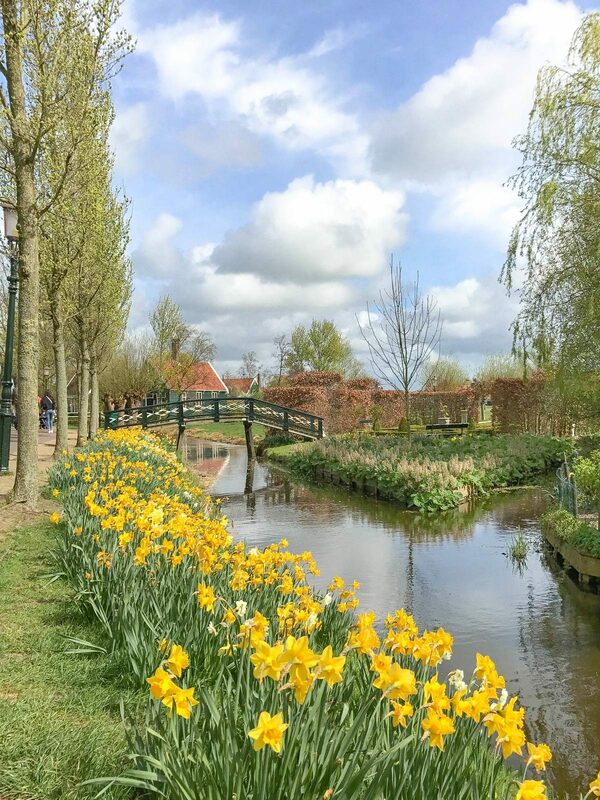 The word ‘tulip’ is synonymous with Holland, so it is not surprising that Keukenhof Garden is a popular excursion. The garden is home to more than seven million tulips that create a visual feast for the eyes during spring. 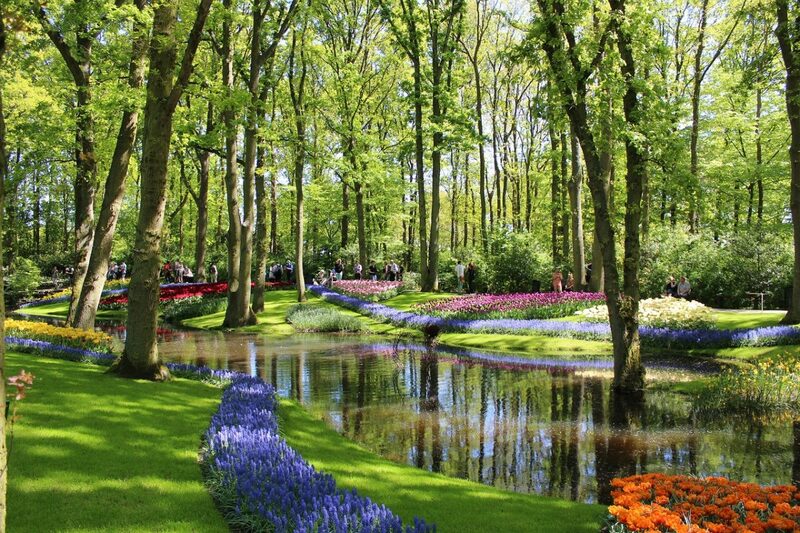 Keukenhof is located between Amsterdam and The Hague, and the theme this year is none other than ‘Flower Power’ in honor of the garden’s 70th anniversary. If you sign up for the guided tour, you will be able to learn more about the history of the park and visit its different indoor flower shows. Each garden has a unique theme, including a happiness garden where you can practice yoga amongst a vast ocean of tulips. Whisper boat trips are also available to take you on a ride around the garden. Guided tours cost €150 and sailing down the canal via whisper boat costs €8. You can also rent a bike for €15 per day to explore the garden at your own pace and stop to take pictures of the beautiful landscape. Read more on how to visit Keukenhof and tulip fields with detailed instruction by clicking here. Undoubtedly one of the quietest towns in the Netherlands, Giethoorn is sometimes known as the Dutch Venice because of just how many canals wind their way between the quaint thatched farm houses, making transport by boat not only preferable but in some cases a necessity. The locals have a special name for their traditional boats, known as punters which are pushed along with a long pole by a punteraar. This is probably also where the comparison to Venice, with its famous gondolas and gondoliers, is taken. It’s much quieter here than most of the other bigger dutch towns due to it being mostly a residential area and it remains very much unchanged since it was first settled in 18th century. There are very few manmade sounds to be heard, it’s very much all gliding water and birdsong, making this town the picture of serenity and quiet living. There are no train station in Giethoorn so you need to plan your trip by train into either Zwolle or Steenwijk station, and then change to the bus №70 to Bushalte Dominee Hylkemaweg. 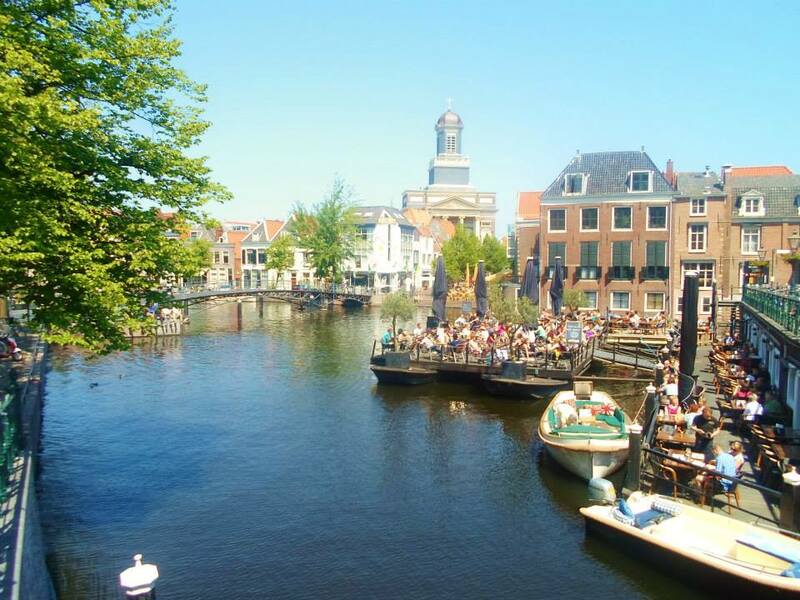 Since I’ve studied and lived in Leiden it’s impossible for me not to mention this town as a good day trip option, especially since it’s just thirty minutes south of Amsterdam and 15 minutes from the airport. Leiden is one of the most important cities of the Dutch Golden Age – it’s here where the oldest university in the Netherlands (1575) was built. Nowadays the town has a large student population, including many international students who come here for an exchange or obtain their Master degree. For tourists, Leiden offers a lot of cafes, bars, and landmarks like the houses of painters Rembrandt van Rijn and Jan Steen. It also features a thousand-year-old historic citadel and plenty of medieval churches. From Amsterdam Centraal Station, the trip takes between 35 to 40 minutes on either the Intercity or Sprinter trains straight to Leiden Centraal. Only 20 minutes away from Amsterdam by train, this quintessential Dutch city is most famous for it’s historical rich Dome and Cathedral which can be seen from miles away and have been around since the 14th century! 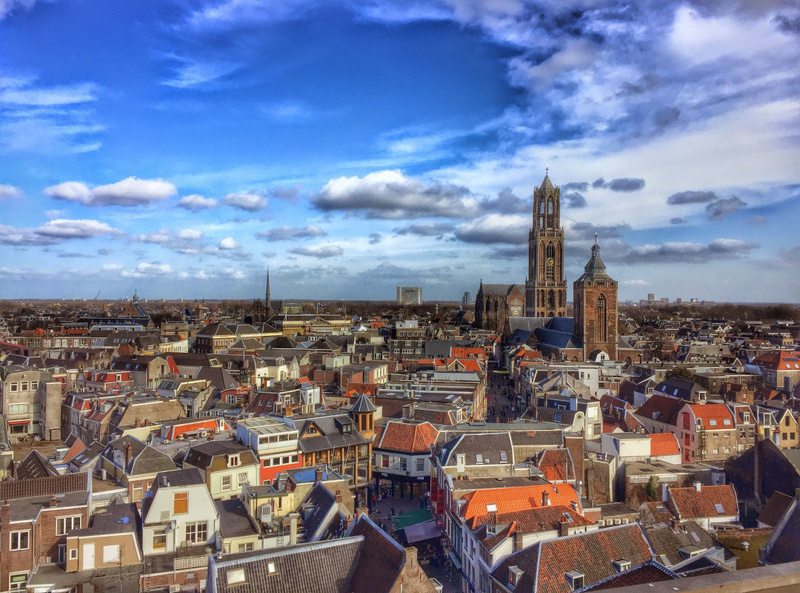 Utrecht may be the fourth largest city in the Netherlands but it’s definitely the fastest growing city in the country. The city centre of Utrecht is buzzing with life, the gigantic Hoog Catherijne mall taking up much of the attention with over 180 outlets and an ever-expanding complex. The TivoliVredenburg nearby is a hotspot for young people and music lovers, with 5 different halls each specifically designed to house separate genres of music. The city is also well known for its museums, having over a dozen museums and galleries in total. One of the coolest ones being the Museum Speelklok which is a museum dedicated to the history of music, filled with interactive displays and instruments you can play! The Sprinter train from Amsterdam Centraal can take you straight to Utrecht Central Station in a little over 20 minutes. Cheese aficionados will find more than just delectable dairy products waiting for them in Gouda. The city boasts a cocktail of medieval architecture and seasonal events such as the festival of lights and the famous Cheese Market. Located inside the beating heart of South Holland, Gouda is only 45 minutes away from Amsterdam and is home to the longest church in all of the Netherlands. Summer visitors can treat their taste buds to a selection of fine dairy products at the Cheese and Crafts Market that opens every Thursday morning from April to August. The market allows visitors to witness the fine art of cheese bargaining by local traders who flock to Gouda in the hopes of selling their products. 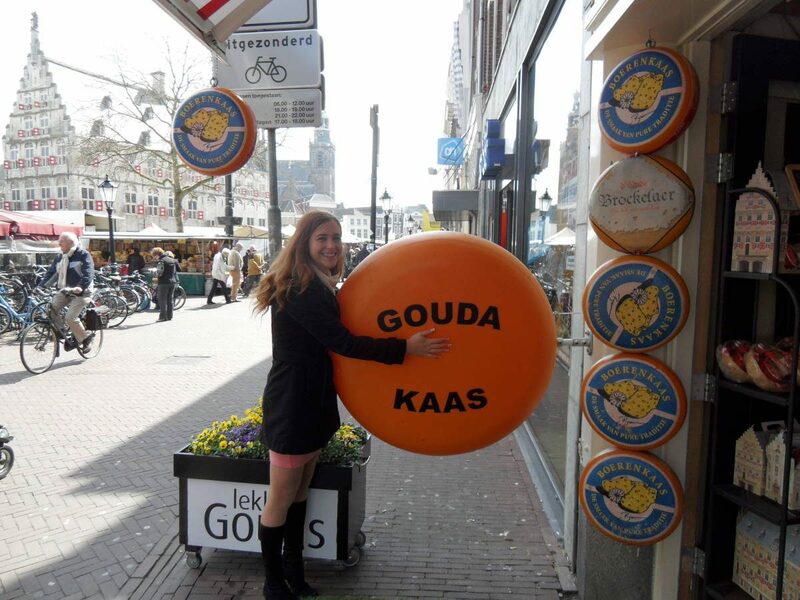 Winter visitors can head over to the Gouda Tourist office where they can pick up a copy of their cheese guide and use it to find the best shops in the city in order to satisfy their cravings. 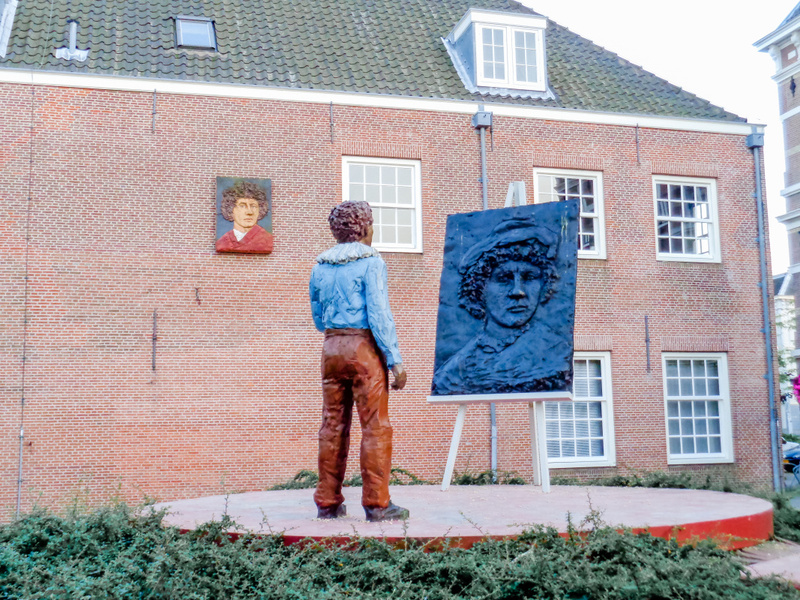 The Gouda Cheese and Crafts Museum is also a must-visit for anyone interested in the cheese-making process. Fans of gothic style architecture can add Gouda City Hall to their itinerary because it is one of the oldest in Holland. Spending your day in this city is not complete without having lunch in a cozy sidewalk café and ordering dessert at Patisserie Van Vliet whose owners are famous for their secret recipe waffles. You can simply hop on a train that will take you directly from Amsterdam to Gouda. Travel time is around 55 minutes. Fans of modern art and innovative architecture can board the high-speed train to Rotterdam, a city that rose from the ashes of World War II to become a center for world trade. Visitors can begin their journey by exploring the city center where they will discover a covered indoor market lined with restaurants and food stalls. Market Hall is the size of a football field and offers a wide selection of fresh bread, cheese, fish and fragrant flowers. The city center also houses dozens of galleries and fashion boutiques that cater to shopping enthusiasts. A day trip to Rotterdam is also not complete without a leisurely cruise onboard the Dutch speedboat. You can book a seven-hour cruise that includes breakfast and a lunch buffet for €59.50 per person. The boat takes visitors on a journey down River Maas where they can take pictures from the open upper deck and enjoy their food before heading over to the Port of Rotterdam. A Hop-on/Hop-off option is available for visitors who want to experience the city by bus as well. You can combine your ticket with entrance to other attractions such as the Wereld Museum. Both the Boijmans Van Beuningen and the Maritime Museums are great places to learn more about the city if your schedule allows it. The fastest way to travel from Amsterdam to Rotterdam is by train. Direct high speed trains are available from Amsterdam Central and a single journey costs around €16. The Hague (often wrongly called just ‘Hague’) cannot be missed as it’s one of the most important cities not only in the Netherlands,but also Europe. This judicial city of the world hosts various international institutions, such as the Peace Palace, International Court of Justice and OPCW.When visiting The Hague I would also recommend a visit to Madurodam, a miniature version of Europe and a stroll around the beach in Scheveningen district. Despite bad weather Holland and maybe not many days that offers some nice beaches and Scheveningen is definitely one of them. The Hague also offers a great Kingsday night – a festival that happens the night before Kingsday (Dutch most important event), with a lot of concerts. 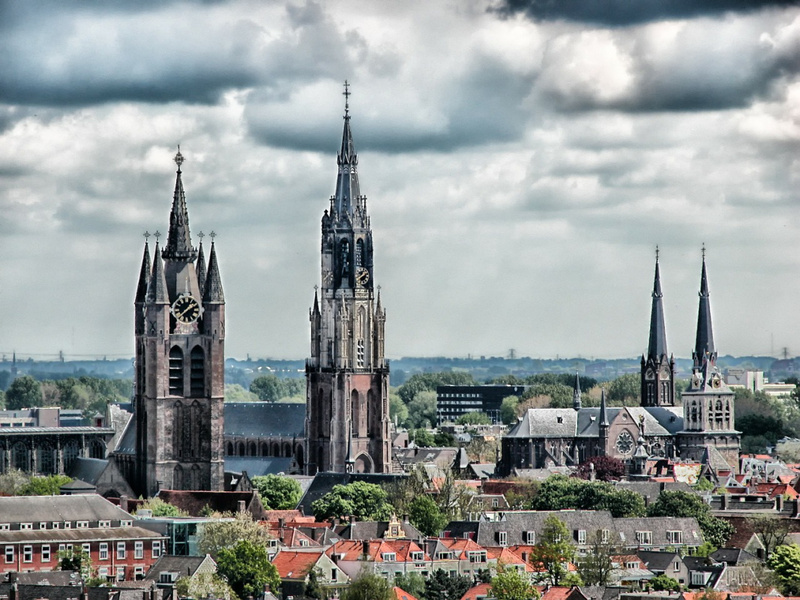 Going on a day trip to Haarlem is a no-brainer for many reasons. First of all, the city is only fifteen minutes away by train from Amsterdam. It was also voted the best shopping city in Holland and the inner city is reserved for pedestrians who can explore the Golden Streets that boast an array of vintage shops and boutiques that sell everything under the sun from bespoke trousers to unique accessories. Head over to the Grote Market Square where you can grab a bite to eat before exploring the many courtyards that are hidden throughout the city. The Cathedral of Saint Bavo is also hard to miss. This gothic architectural gem is home to gargoyles, antique collections and Romanesque arches. 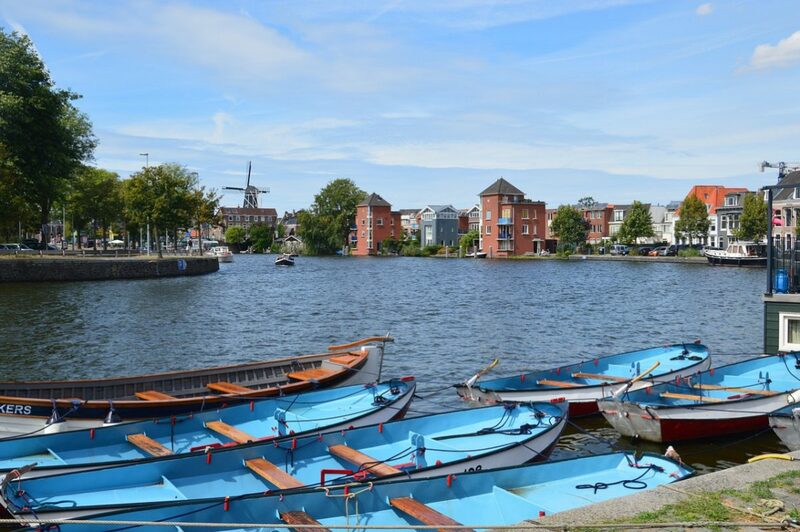 50-minute cruises along the Spaarne rivers are also available, and they include a visit to the Teylers Museum and a trip to the Jopenkerk Beer Brewery. Tickets cost €13.50 per person. The short 20 Km distance makes it easy to travel from Amsterdam to Haarlem by bike. NS trains are also available to take you on a 15-minute trip directly from Amsterdam Central Station. 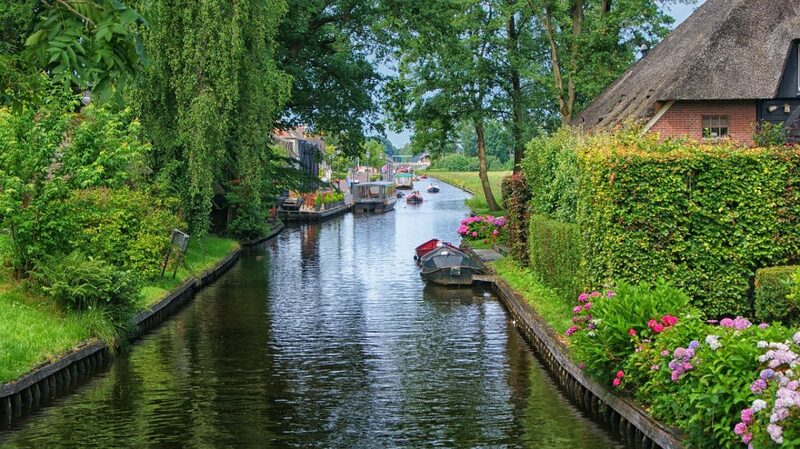 The picturesque city of Delft is less than an hour away from Amsterdam. This beautiful place is mostly known for its history that leads back to the time of royal family and its founder, William of Orange who notabene was shot in Delft. Delft was also the birthplace of one of the most famous and also one of my favorites Dutch Golden Age painters – Jan Vermeer, who can be recognized by his famous painting A Girl With a Pearl Earring. Visitors can see the streets, canals and churches that Vermeer portrayed in his masterpieces, or even take a tasting tour to one of the town’s breweries. 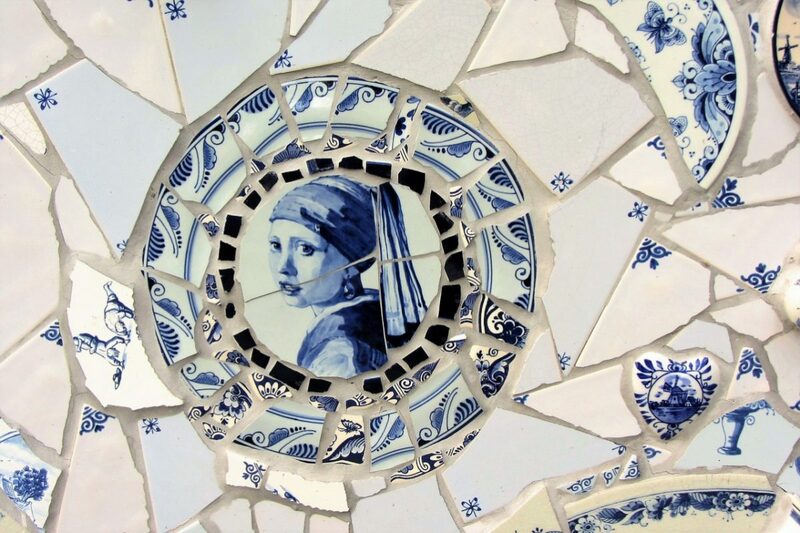 Delft is also known for its famous blue and white china that became well-known on the international level. You can buy some to bring home with you. The trip takes 45 by the Intercity train from Amsterdam Zuid Station. Nature enthusiasts will fall in love with this precious gem of a park and its breathtaking landscapes. The park is home to foxes, red deer and European badgers. It also has a rich and diverse population of birds such as woodpeckers, and harbors a forest filled with oak and birch trees. Visitors who prefer to explore the park by foot are offered three different routes where they get to explore the reserve and do a bit of wildlife spotting at the same time. White Bikes are also on offer for anyone interested in taking the 40 kilometers designated route around the park. Hidden deep in the forest is none other than The Kröller-Müller Museum where a private Van Gogh collection is on display. Tickets to the park cost € 9,95 for adults with a special discount for visitors traveling in groups. You can visit the park’s website for more information regarding opening hours and seasonal events. There is a direct train that takes you from Amsterdam Central Station to Arnhem Station where you can board bus number 9. 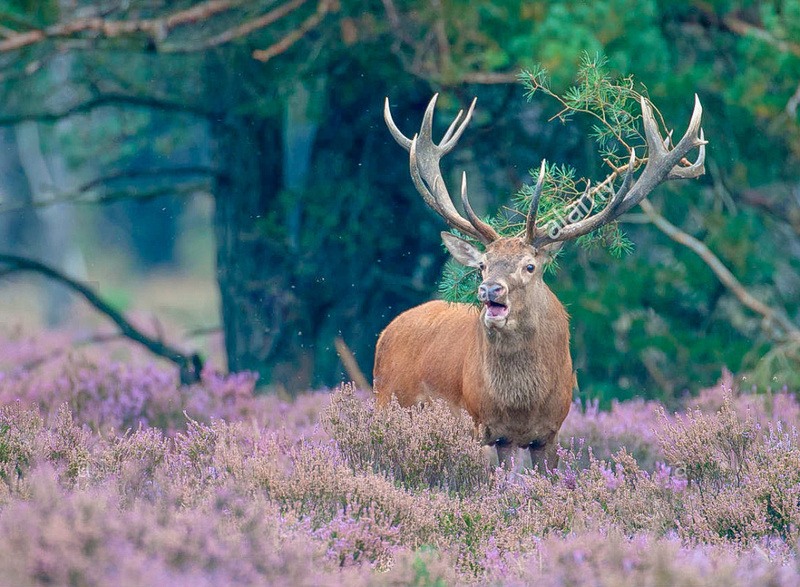 This bus will drive you to the nearest bus stop which is a mere 3-minutes walk from Hoge Veluwe National Park. You can use aublic transport OV-chipcard to pay for your journey. 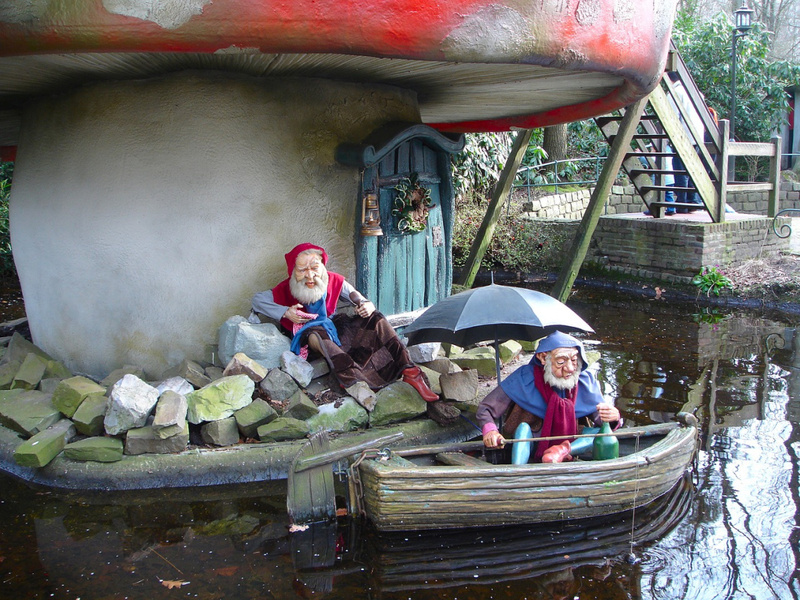 If you’re looking for a magical and fantastical experience in the Netherlands, visitors absolutely need to plan a trip to the largest theme park in the country at Efteling. With around 24 incredible rides and 15 different restaurant options, the park is open every day of the year and has attractions for the whole family, all ages and all levels of thrill. From castles and magical fairies to dragons, trolls, water rides and high-speed rollercoasters! They’ve got special live shows at different times of the day all around the park and there’s always something new and exciting to discover. The magical Aquanura water show takes place every day for 12 minutes of lights, fire, water and beautiful music. 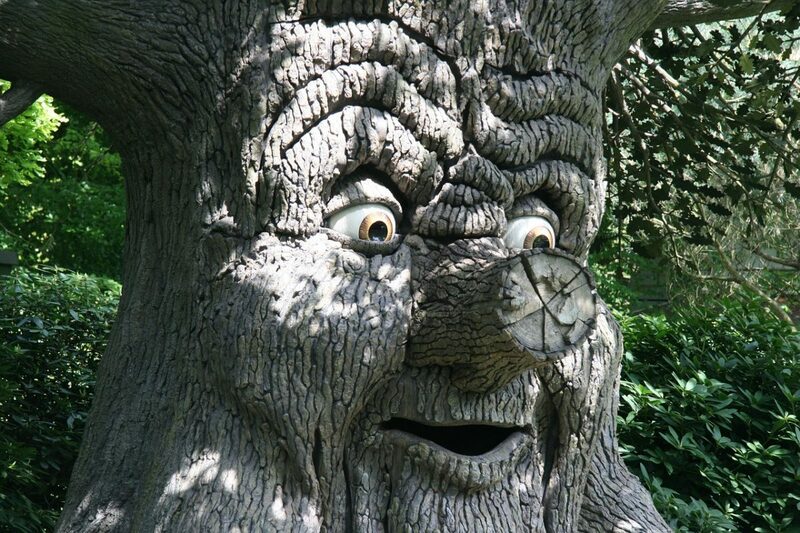 The park is open from 11am during the week and 10am on weekends so it would take at least two days to see everything that Efteling has to offer. It’s possible to spend the night at one of the hotels, holiday homes or apartments that the park have on offer in order to make the most of your visit. You can buy a year-round or a low season ticket for €38 and €40 online and children under 3 get in for free! If you buy tickets online you get a €2 discount. The convenient 2-hour journey takes you from Amsterdam to S-Hertogenbosch by train and then on to Efteling by bus. 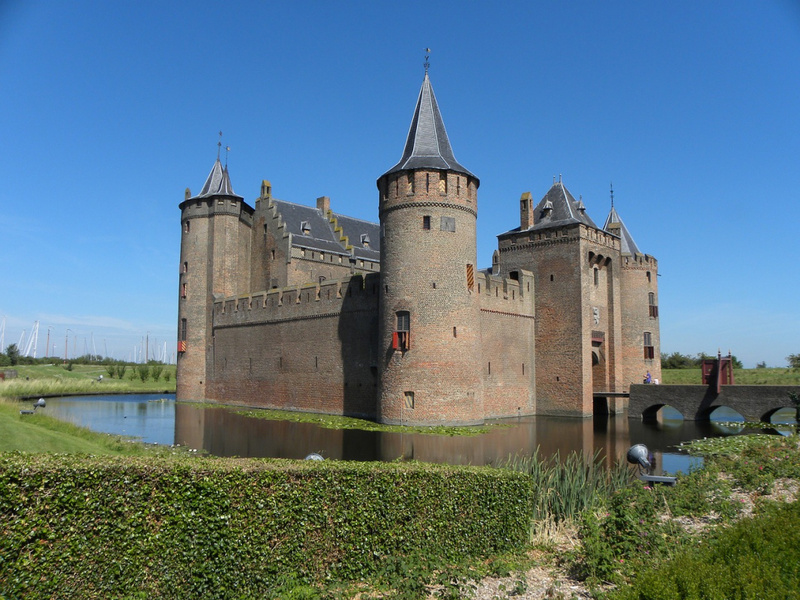 Located at the mouth of the Vecht River in the south-east of the country, Muiderslot Castle is about 15 minutes away from Amsterdam by car and is a well known moated castle that has featured in several tv shows throughout the years. History lovers will be in awe at how the castle has been preserved and of the rich museum within that represents 700 years of Dutch history. There’s so much to see in the castle and surrounding landscape. The museum houses collections from the middle and golden ages all the way up to 19th century and modern day. They’ve got various tours for visitors to pick from including a knight’s route and an insight into how the castle was an important water defence feature of the country. Not to forget visits of the lush castle gardens and close up encounters with some beautiful that live on the grounds. Tickets are €15,50 for adults and €9,00 for children between 4 to 11. The park is not open every single day during the summer and is not open Monday to Friday during the winter season so you’ll just want to double check that it’s open on the day you want to visit. The Amsterdam tourist ferry offers a daily service (except Mondays) from the Amsterdam marina to the castle for €20. Otherwise you could take the train from Amsterdam centraal which takes about 50 minutes. Where Muiderslot is the oldest, De Haar is the largest castle in the Netherlands, complete with fairytale turrets and a grand courtyard entrance. 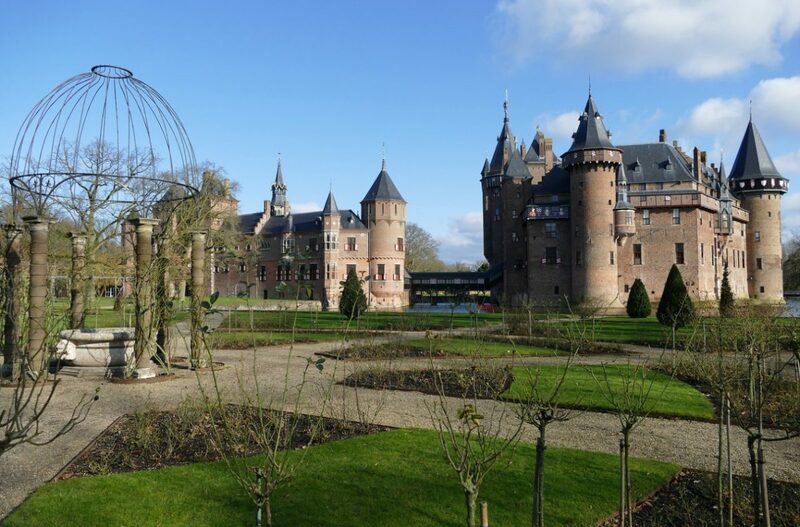 Located near the village of Haarzuilens, mentions of the castle date as far back as the 1300s. It’s open for visits almost every day of the year Monday to Friday except on some public holidays or when they host special private events such as weddings. Visitors can peruse the castle at their leisure or enjoy tours of the special tours if in bigger groups. The castle hosts special events throughout the year like a Christmas fair in December and Elfia, which is an event for the fantasy lovers that includes dressing up, market stalls and exciting performances. There are different tickets to visit the castle (€17,00 for adults, €11,00 for children 4 to 12) and the park (€6,00 for adults, €4,00 for children between 4 to 12). If you’ve bought a museum card then a trip to both of these is free. The easiest way to get to the castle is from Utrecht Centraal Station via bus 9 towards Kasteel De Haar. This doesn’t run every day however, so you may have to take the Sprinter train to The Hague Station and stop at Vleuten Station. 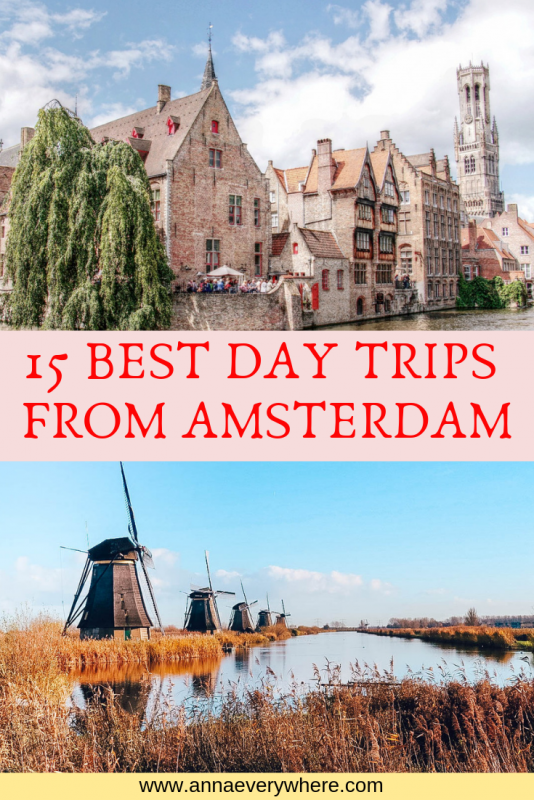 How cool is it that you can visit two countries in one trip when you travel to Amsterdam, by planning a day trip to the beautiful little town of Bruges in Belgium. 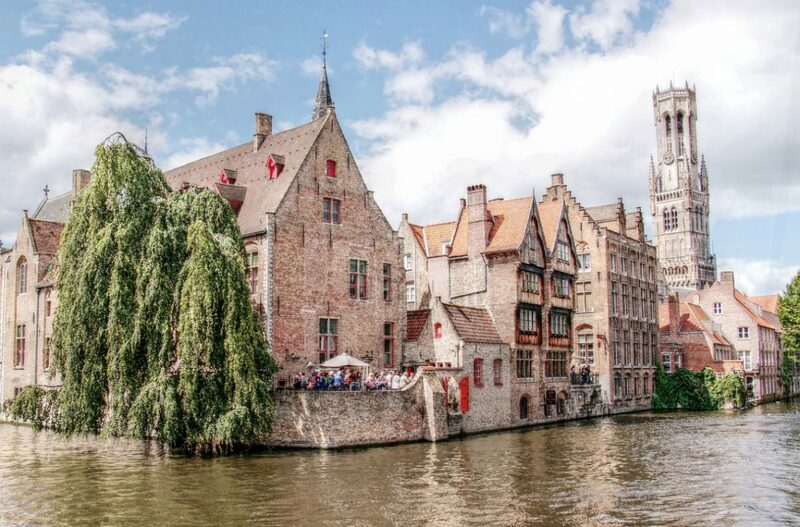 Bruges has many characteristics of the Dutch culture being so close to the border including the canals, cobbled streets plus stunning medieval architecture. The area has actually been named a UNESCO World Heritage City for how well it has managed to preserve its historical landmarks over the years. There’s so much to do and see in the city that it would be impossible to see it all in a day but some of the most popular sights and attractions include the Burg, a stunning historical building which incredibly dates back to the 2nd Century AD. There’s also the Rozenhoedkaai area with its picturesque view and Belfort which houses the traditional Carillon bells that attract large crowds when they’re rung during the daytime. 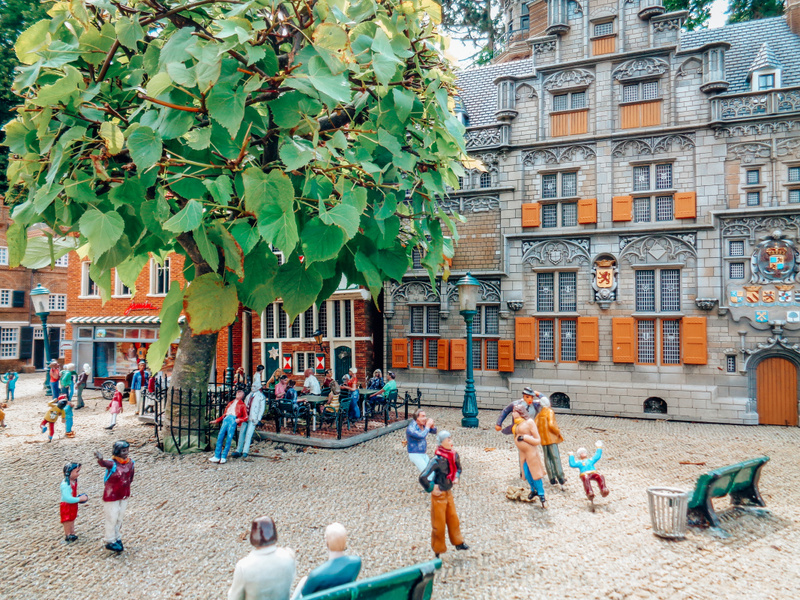 Bruges was also the home of the famous painter Jan van Eyckplein and the famous mathematician and physicist Simon Stevin, who both now have statues and squares that have been dedicated in their honour. There are over a dozen monuments to visit including cathedrals, museums, and famous houses, all of which are seeped in history and adorned by the delicate structural design of their time. Many tourists often overlook visiting other interesting places in the country. 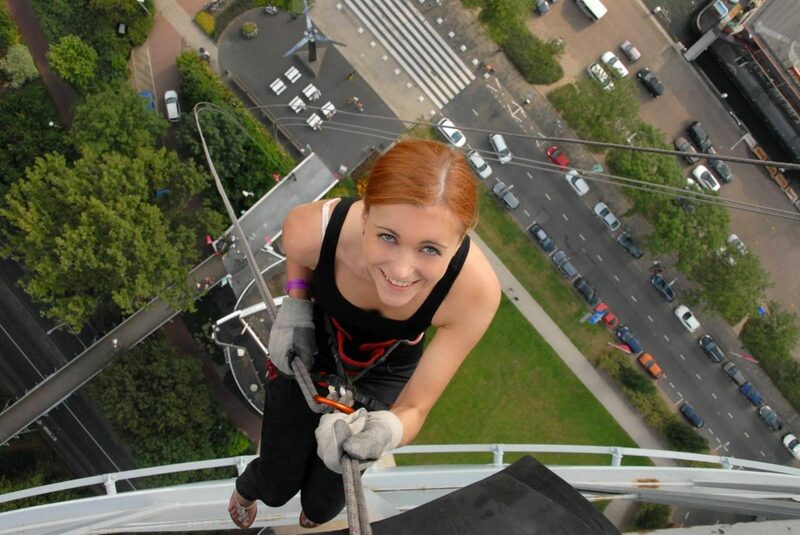 This is why I wanted to show travelers that Holland is not only cheese, weed, and canals in Amsterdam. Previous Post Are Travel Bloggers Allowed to Criticize Instagrammers for Ruining Travel? Great post! I have to say, I am Dutch and have not even visited everything on this list. Guess I have something to do when I return to Holland for a bit. Personally, I think The Hague and Rotterdam are better than Amsterdam. There is so much to see and it is not that touristy as Amsterdam. Still enough tourist, but not that you get overwhelmed.